Yay for a somewhat original post!! Okay, checkerboard nails have been done, but I can say I did not see this manicure on someone and copy it color for color. This was actually the manicure I wore on Valentines Day. Since we all know I generally dislike that holiday, leave it to me to wear something blue. I was out of black polish. If i did have some, you can believe I would have had some sort of black manicure. So my tape obsessed little self decided to do a tape checkerboard manicure, which to me turned out looking like the tiles on a bathroom floor. Maybe not a bathroom floor in anyone's house, but maybe in a public restroom. I swear I had something similar in my high school way back when. Let's see what you all think. Again, back to the white background on the lightbox. I need to play around with it some more....and well rebuild the side. After taking the pictures, I placed my lightbox on the floor while uploading the photos to the computer. When I went to get out of the chair, I stepped right through the side of the thing. At least it was only the tissue paper and the cardboard itself is intact. Still though, dumb move on my part. 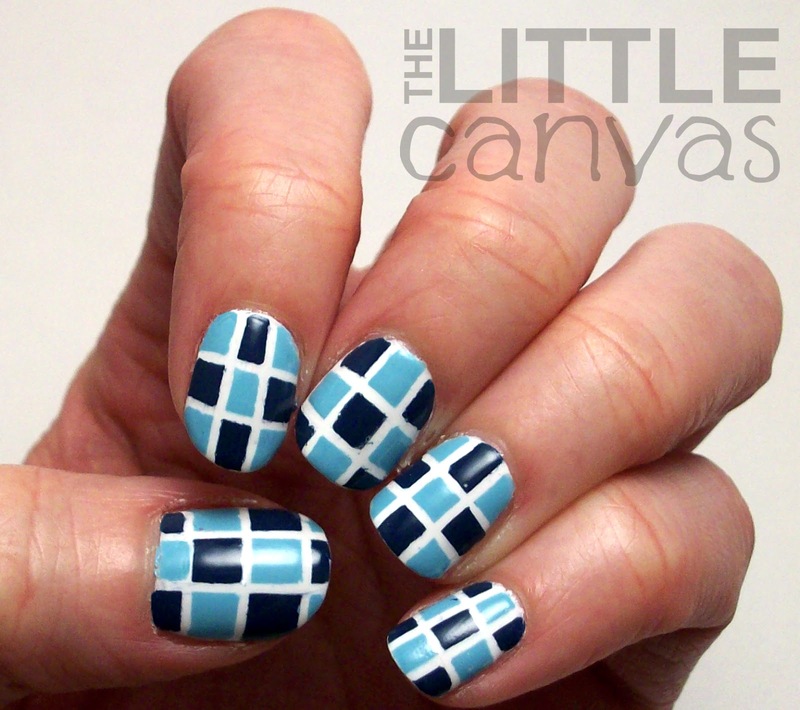 Sally Hansen - Blue Away! 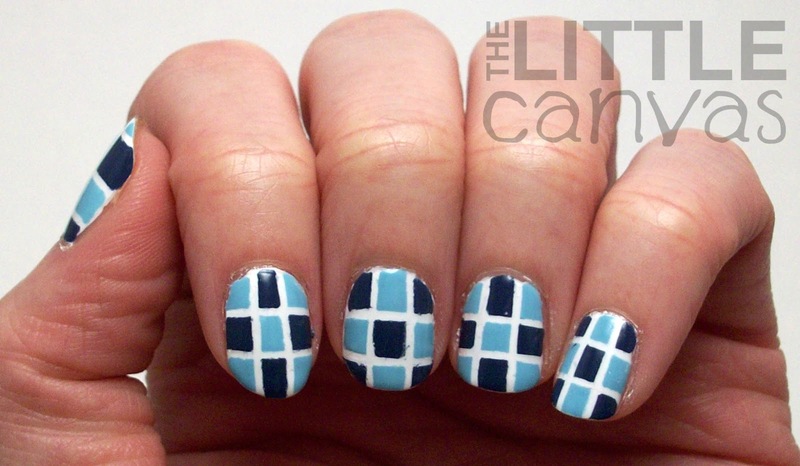 To get this manicure, you start off with a base coat of white polish. For this manicure, I used two coats of Snow White. I could have gotten away with 1 coat, but I wanted the white to really stand out. 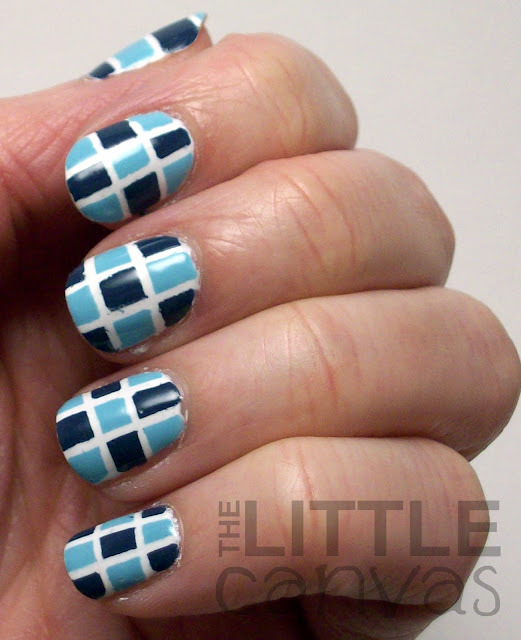 Next, with four pieces of nail art tape, I created a checkerboard pattern as shown below in the crappy webcam shot. With my dotting tool, I dotted in Rain Storm and Blue Away! in the appropriate squares. Both polishes dotted in like a complete dream. Rain Storm, just like any Sinful, is very easy to work with. Sally Hansen's Insta Dry polishes are a miracle as well to dot with. While the polish dries fast, it doesn't dry so fast that you can't work with it. Can we also talk about how gorgeous that baby blue is?? Love it. When I was done, I removed the tape one piece at a time revealing the checkerboard pattern. I let the nails dry a bit themselves and then added the top coat. Kind of loved these nails, and cannot wait to attempt them again with other colors. I have an idea in my head right now with what I'm going to do when I attempt them again, but I'm not going to share. It's a secret :P.
What do you think? Loving my tape manicures?? If you need some nail art tape of your own, head on over to the Born Pretty Store to purchase some. Use the code AMBK31 to receive 10% off!!! Even though this is inspired by a tile... THESE LOOK AMAZING! Love them! thank youu!!!!! I can't wait to try them again in different colors. they were rather easy! Easy and something new and cool ;D you are a genius, my friend! after i finished it was the first thing that came to mind! regardless, they were fun! it was so much easier than trying to use the brush! just put a little polish on a plate and a medium dotting tool and filled it in. the top coat smoothed it all out since sometimes using dotters can make the surface feel weird. Maybe a thicker white paper would help keep the light in the box instead of "dulling" a bit? Like pieces of white poster board?